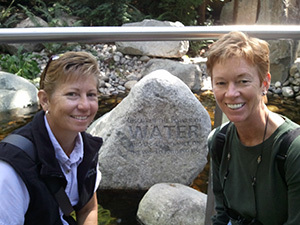 Heads Up Sprinkler Co. co-owners Patty Sipe (left) and Caryn Walz focus on saving water for clients. Photos: Heads Up Sprinkler Co.
A Texas irrigation company makes water conservation its top priority. The drought that hit Texas in 2006 was a wake-up call for Patty Sipe, co-owner of Heads Up Sprinkler Co. in Plano. It was time to look at some aspects of her irrigation business differently. That drought and the ones that have ensued almost every year since have been catalysts for the company to rethink everything through the lens of conservationists and teachers versus a mere service provider, says Sipe. The $500,000 company, co-owned by Caryn Walz who founded it 18 years ago, primarily services residential clients, offering irrigation system repair and long-term care services. It also provides irrigation system auditing services for commercial properties—a service it introduced in response to tightened water-use restrictions. Sipe expects this service to expand in the coming years. That growth isn’t necessarily the goal for Heads Up Sprinkler, though, Sipe says. The goal is to save as much water as possible while educating clients about why it’s so critical. Photos: Heads Up Sprinkler Co.
Sipe says the most important piece of the puzzle is educating the homeowner. Each Heads Up Sprinkler technician is trained to spend as much time with each client as necessary, explaining the issues, listening and answering questions. This method builds trust between the company and the client and helps clients make a connection between the irrigation system controller, or “that thing in their garage,” and their water bill, Sipe says. Once clients see that wasted water equals wasted dollars, they begin to pay more attention. Customers typically understand or have the “aha moment” when they see their water bill go from, say, $300 to $125, Sipe says. With that, Sipe recognizes water conservation is a long-standing issue in Texas, which is why she says, now more than ever, it’s important to spread the knowledge. Alongside its hands-on approach to repairing irrigation systems and educating clients, Heads Up Sprinkler continues to educate people about water conservation on a larger scale. 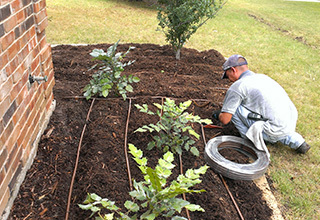 For instance, as a member of the Water Efficiency Network of North Texas, Sipe voluntarily teaches water management techniques to homeowners as well as heads of city water management programs—many of whom are required to meet 10-percent conservation goals annually throughout their regions.